With extreme cold temperatures gripping our region, comes the real potential for frozen pipes. When water freezes, it expands, and weak metal or plastic pipes that aren’t insulated are more susceptible to bursting or leaking. In many cases, the ruptured pipe is not discovered until after the ice begins to thaw and water starts flowing again. 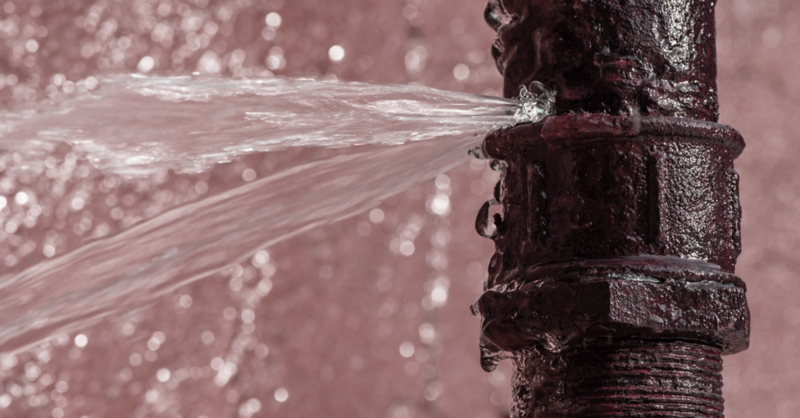 If a pipe has burst, you’ll immediately notice abundant water or a rushing sound in the walls. Locate the property’s main water valve and shut it off immediately if safely accessible. (Make sure you know where the valve is located ahead of time.) Electricity should also be cut off to the section of the property where the water damage has occurred. You’ll find the stop tap on the water main. It is often located where the main service pipe connects to your property. Once you’ve turned off the water, you’ll need to drain the pipes. Run cold water on all the faucets. If you’re in a home or residential building, be sure to flush each toilet at least once. Shut off the hot water heater. Once the hot water system is off, go back to each faucet and run the hot water to drain that supply. When there is no more running tap water, the leak will stop. Once water damage has occurred in the property, it’s imperative that a professional water restoration company, like 24 Services, is brought in to complete the water mitigation process correctly. Improper drying of a water loss is dangerous and could lead to mold, mildew and other serious health risks to future occupants.